Today, as a part of the 2016 SustainableUW Festival, the University of Washington celebrated its recertification as a Salmon Safe university. Salmon Safe certification entails meeting rigorous standards for irrigation efficiency, stormwater management, pesticide reduction and wetlands area management. The University of Washington was originally certified in 2011. This certification included a number of conditions which the University had to meet between 2011 and 2016. This new 2016 certification also comes with new conditions, helping the University to ensure it’s keeping up with new best practices. “The University’s main campus here along with the campus in Bothell and the Washington Department of Ecology in Olympia were the first campuses to be certified as Salmon Safe in all of Washington,” said Huttel. “The University of Washington is just a prime example of the public sector leading the private sector. We’ve now seen a number of large, noteworthy institutions now following the University’s lead. Representatives from Salmon Safe’s site visit team visit the University Slough and Union Bay Natural Area. 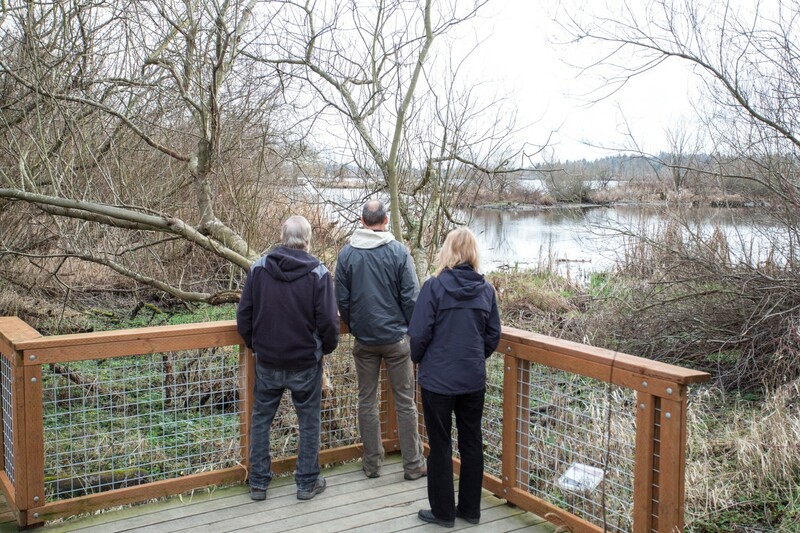 The team inspected the University’s grounds and operations to ensure it meets with Salmon Safe’s rigorous standards. “It’s not just an award; Salmon Safe educates, advises, directs and recognizes. It pushes us into lots of new areas, and forces us to think and to continuously improve our practices,” said Salmon Safe project manager Anne Eskridge. Some of the new conditions the University must complete in order to be recertified again include expanding its water conservation and fertilizer management plans, and updating its policy and planning documents for integrated stormwater management.